Tool Storage is a compartment by the Fitness Room containing a variety of useful tools. It is accessible by many jobs, even Staff Assistants, who can use their savvy and the tools here to break into pretty much anywhere, if they want a present and letter from the boys in red. Botanists often rush here as soon as the round starts, as well, so they can hack their Seed Fabricators and make the good stuff. A general manufacturer for making more tools. A reclaimer for refilling said manufacturer. Metal sheets, both regular and reinforced. Fuel tanks for refueling welders. Welding masks for safe welding. Black gloves. Not insulative enough to protect you from door shocks, but it's still enough to let you safely hack vending machines and fabricators and tear out bulbs and light tubes that are still on. A PC for spamming ASCII art everywhere. Handy utility belts to hold all these tools. A cyborg dock for robot friends. Though this room has no vent, air from the Cafeteria, which can be resupplied from the West/Port Emergency Air Hookup, can fairly easily flow into here. There is also a canister of air here for more manual refilling. 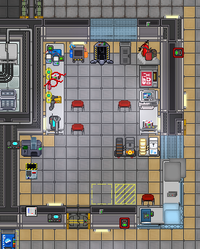 The APC for this room is located in the maintenance area right of here, just outside the door on the right. The power is supplied via a cable in the same maintenance area that runs under the same door. This is a compartment aboard the space station accessible to many different jobs containing a variety of useful tools. It's located between the bar and hydroponics. It is even accessible by assistants, who can use their savvy and the tools here to break into pretty much anywhere if they want a present and letter from the boys in red. Botanists often rush here as soon as the round starts, as well. This is a compartment aboard the ship accessible to many different jobs containing a variety of useful tools. 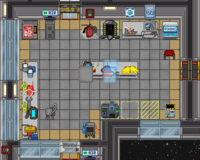 It's located between EVA and the Courtroom, right across the hall from Medbay. It is even accessible by assistants, who can use their savvy and the tools here to break into pretty much anywhere if they want a present and letter from the boys in red. Botanists often rush here as soon as the round starts, as well. This is a compartment aboard the ship accessible to many different jobs containing a variety of useful tools. You can tell it's a very dedicated compartment because it has two general manufacturers/autolathes instead of just one. It's located next to the Bar and right across the hall from EVA. It is even accessible by assistants, who can use their savvy and the tools here to break into pretty much anywhere if they want a present and letter from the boys in red. Botanists often rush here as soon as the round starts, as well. 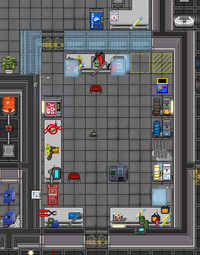 This little room is called Primary Tool Storage (or sometimes just Tool Storage), because it is the station's primary source of useful things like tools and sheets of metal and glass. It's located in the southern sections of the station, across the hall from Security and a few paces south of the Crew Lounge. Unfortunately, there is no autolathe/general fabricator here, so whatever's taken from here is gone for good. There is a public autolathe/general fabricator somewhere else though, quite a distance from here, in its own little cubbyhole. The APC for this room is near the southwest corner, near where the emergency fire closet (or at least where it would be). The wire that power to this room is in the maintenance tunnel below. 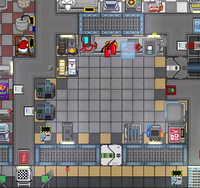 Chiron doesn't quite have a tool storage room, although the engineers do have their own departmental storage room that connects to the main hallway. 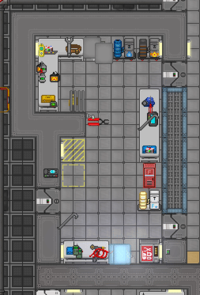 You don't have to steal from there though; there's a public general manufacturer east of the Gym and west of Crew Quarters. This dark, ill-lit compartment of maintenance is called Tool Storage, because it, well, stores tools. It's kinda in a weird place. 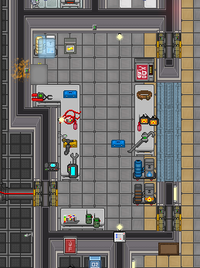 Lots of jobs use tool storage, but unlike other stations, where tool storage room is publicly accessible from the main hallway, this one is tucked away in the northern parts of the south asteroid's maintenance tunnel, near a group of people who can't access it all. It's probably for the better, anyways, because everything you need to ruin the station is kept in here. There's welding tools and wrenches to tear it apart; welding fuel, igniters, and timers to blow it up; metal and glass sheets to barricade the halls and doors; wirecutters, multitools, and screwdrivers to hack through everything; and, most importantly, utility belts to hold it all (well, most of it anyways) and a general manufacturer to replenish it. 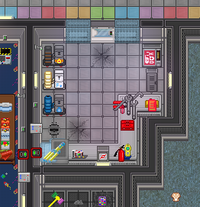 The APC for this room is near the southeast corner, behind the rack of belts and extinguishers. Tool storage. Duh. So sad. A tankful of welding fuel, a few 400-unit fuel cans, and welders to heat them. No bomb is as simple yet effective as the good ol' lit welder under a fuel tank. All the metal sheets you need to nullify the AI's turrets and build pipe frames for pipe bombs. A Vendomat, still stocked with plenty of igniters, signallers, and other electrical components, all ready to be fitted onto a bomb. Miles and miles of wire, in cable coil boxes and electric toolboxes. Can't make pipe bombs without them! Loads and loads of emergency glowsticks. You could use them to light up some dark place, but do you know what they do inside a pipe bomb? Heck, even those power cells can be useful. Ever made stun gloves? Or stuck them in a pipe bomb? An energy-shield generator. Okay, we're stuck on this one. You can probably set to solid shield and put in some busy hallway to annoy everyone, but that's all we've got. There is no vent. Tools don't need air. Neither does destruction. The APC for this room is near the southwest corner. This page was last modified on 25 April 2019, at 17:01.